So many singers have attempted to sing the legendary Puccini aria, Nessun Dorma, from the opera, Turandot and so many have failed to master the subtle nuances and the refined control it takes to correctly perform this song. Considered to be one- if not the most difficult song- to master, it always amazes me that so many singers nowadays have the audacity to add it to their repertoire without consideration for the time, technique and expertise it requires to master all the technical and performing elements. Everyone wants to perform this number and, as long as they can belt out the notes, perform it they do with little knowledge of what it takes to sing this song correctly. The Nessun Dorma yardstick by which all performances should be measured was created by the legendary Luciano Pavarotti and singers would be wise to follow his lead and master the song correctly before taking it out on tour or adapting it to their own performing style. In other words, sing it clean! He set the standard very high many years ago and his version is hard to beat. The aria flows from his mouth and his vocal tone is transparent and pure. And watch his face. There are no signs of strain anywhere. His mouth is round, his eyes and jaw are relaxed and his forehead is wrinkle-free. This enables him to focus and resonate the extremely high melodic line with consistency, the head voice central to the vocal mix. There is no strain in his voice, no constriction as he sustains and projects the tenor line. If I can find fault, it would be that, perhaps, the emotion took a backseat to the vocal delivery. But, his vocal excellence cannot be overstated – this is operatic singing at its best. 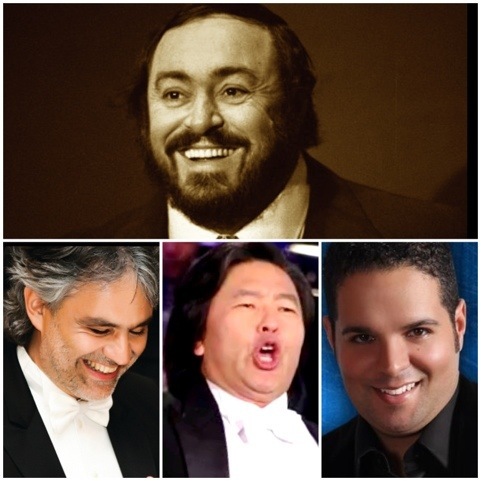 So, who are Pavarotti’s true successors? Who are the real deals in this modern age? Here is my Masterclass list, seen here in alphabetical order. Classical purists would disagree with me regarding Andrea Bocelli. Many feel that he made it to superstar status because of his blindness. Well, that did help his cause but in the above performance of Nessun Dorma there is no denying that the technical elements are in place. The round mouth, relaxed jaw, the expansive eye muscles, all contributed to a beautifully focused sound. He does have a lighter approach to this song, almost tentative in fact, but the vocal sound is generally spot on and beautifully sustained. However, the emotional elements were less visible during Bocelli’s performance, who was, perhaps, inhibited because of his blindness. Nevertheless, the vocal sound is liberated and consistent and devoid of any tension or constriction. The sound is where it should be – front, center and clean. The talented Korean tenor, Park Gi-Cheon, is quite the unstoppable force. His clean, passionate performance of Nessun Dorma bears a striking resemblance to that of Luciano Pavarotti. Every note is in place, his facial features are open and relaxed and he delivers his vocal performance with a clean, uncluttered, perfectly focused and sustained manner. His phrasing is impeccable and the technical control is masterful. Unfortunately, in this instance, the technical brilliance overshadows the performance aspects of this number, but he does nail every single note and phrase. Perhaps, the expressive elements will be revealed over the course of time. Rising star, Fernando Varela, will blow your mind with his singular interpretation of this aria. There are many extraordinary moments during the above performance but two are worthy of particular mention here. At the 2:37 mark, his sustained crescendo on the word, splendera, is absolutely magnificent. The best I have ever heard. Then, at the end of the song, he adds a vocal surprise by adding two upper notes that rock the house during this Singapore performance. Watch it – your jaw will drop along with his! His performance is intense, technically secure and his style is classical yet current. He makes classical music sound cool and edgy, mainly because he has embodied so many different styles of music in his performances. And, emotionally, he is in sync with the lyrics, communicating the emotion in an expressive and nuanced manner. Truly a signature performance and one that has not been duplicated by any other singer. So, those are my Top 3 current performances of this operatic classic. What – you say? No Paul Potts? Sorry, no. While this gentleman has a gorgeous voice, his technique is very green and his emotional approach even greener. I hope that he really invests his money into a solid vocal coach who will guide and shape him into a refined, technically sound vocal artist. The gift is there – but many singers have this vocal gift. Technique and study enable true stars to exceed and grow over the course of time. How do you feel about my choices? Do they compare to Luciano Pavarotti’s rendition? Do you have any favourites that I may have missed? Please add your comments and links in the comments box below. What a great idea – a Nessun Dorma Sing-Off!! I was not familiar with either of the last 2 singers – thanks for introducing me to them. I think of the 3 singers, Fernando is my favorite. I love Andrea’s voice but sometimes his consonants are a little indistinct, at least to me. The Korean tenor is technically amazing but I don’t think he was singing an aria. He was singing beautiful notes. Here is a performance I love by Joseph Calleja, who is known as the Maltese Tenor. Oh my goodness Darlene. He deserves to be featured in my initial blog topic. He is simply amazing. His voice is so fluid and he sings with genuine passion and love. Very inspiring. Yes, Fernando is my favorite as well and we were fortunate to have just featured him in concert here in our city. He is on his way to a spectacular career. Oh my stars, Darlene! Thank you for sharing. INCREDIBLE. I had goose bumps and chills throughout the entire video. This is definitely an aria requiring such a technical perfect voice but one requiring an equally emotional performance. Of all performers my favorite was Fernando Valera. Just wanted to point out – this isn’t the most difficult aria in opera, far from it. Di quella pira or Ah mes amis or Vesti la Giubba depending on a voice type would be more challenging. This is in terms of just hitting the notes. Of course as anything, it’s difficult to sing well – with the legato, with effortlessness, with artistry. In terms of Pavarotti’s setting the standard, it’s really the matter of opinion. A lot of people would prefer Bjorling, Corelli or Del Monaco’s interpretation. I’d also want to point out that holding the last note isn’t required. Singers added it for styling, but Puccini didn’t write it. Corelli for example doesn’t do it, but he is still wonderful. Also, it’s worth to notice that while Pavarotti sang Nessun Dorma in concerts a lot, he stopped singing the role of Calaf (the character who sings it) in opera after only a few performances because he felt it hurts his lyric tenor voice. The role is written for a spinto or dramatic tenor i.e. stronger, heavier voice. I am probably going to get some flack for this, but I would like to point out a performance that I think is very remarkable considering it is being performed by a little girl who just turned 11 years-old at the time it was recorded (April, 2011). I understand the rules regarding who and at what age a person should sing this aria and the awkward application on the lyrics in retrospect to the gender and age of the performer (note that discussions on this have been done ad nauseam on many forums), but I hope you would agree that this performance is worthy of mention. When I heard it for the first time tears were streaming from my eyes because I was moved by it so much. This is Jackie Evancho singing Nessun Dorma on PBS Great Performances. Ken – actually this is a beautiful, unique version of Nessun Dorma and, yes, she is too young and the wrong gender to be performing this song. But, it’s show business and that’s what sells. My greatest concern is her technique – that quivering jaw really worries me. And she has a closed vocal delivery – like she is manufacturing an older operatic sound. Her voice does not sound free. But, she is a marketable commodity – a great package. She is a sweet, angelic young girl with a sweet, angelic voice. But, as a voice teacher, I do worry about her vocal health over the course of time. Thank you for stopping by and adding your comments along with the link. It is much appreciated.